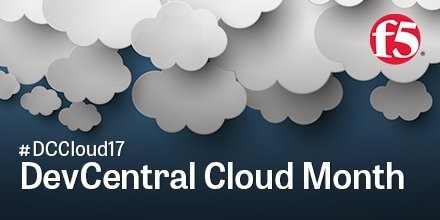 You got a mini taste of DevCentral’s Cloud Month last week and week two we really dig in. This week we’re looking at Build and Deployment considerations for the Cloud. The first step in successfully deploying in a cloud infrastructure. Starting today, Suzanne and team show us how to deploy an application in AWS; On Wednesday, Greg, harking the Hitchhiker’s Guide, explains Azure’s Architectural Considerations; Marty uncovers Kubernetes concepts and how to deploy an application in Kubernetes this Thursday; on #Flashback Friday, Lori takes us down memory lane wondering if SOA is still super. Filling my typical Tuesday spot, Hitesh reveals some foundational building blocks of F5’s cloud/automated architectures.